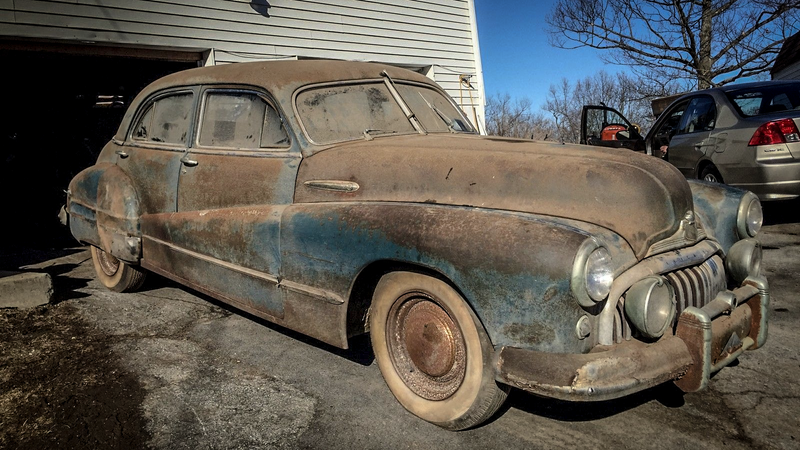 In this edition of Barn Find Friday, we're taking a look at some of the best and most patina'd classics that you can find for $4,000, or a budget that would make the average vintage car collector ask why you made them get out of bed for so few zeros. Get a tetanus shot and come right in! Not much is known about this little red microcar, other than the wealth of information on Wikipedia because Google is a thing. It was originally billed as a 500-lb car for $500, a tall order for such a short car. This 1961 version cost $900 new and was powered by a Briggs & Stratton single-cylinder engine that produced a little more than a new lawmower. If you're looking for exclusivity, you're more likely to run into a Bugatti Veyron than you are seeing one of these. Pick it up for cheap, restore it, and enjoy it for years to come. If you've ever been a fan of Johnathan Ward and his ICON Derelict line of cars, you'd understand the demand for big-bodied old classics like this Buick Super Deluxe. You can have all the old-timey exterior swag, with twice the imminent danger. Sure, it would look awesome resto-modded, but a true rat rod with suspension and chassis design from the '40s would be a true test of driving ability. Get it before someone smarter does. This Ford Police Interceptor is a car that will have the old-timey mechanics, between drags of their unfiltered Marlboros, talking about how "she's got cop brakes and cop suspension". This car does have the demeanor of a police highway cruiser, but it's missing drivetrain components. Fortunately, the seller also has a parts car that can be had for a little more than the ~$2,000 asking price. For a project, it would be an awesome undertaking. I'd put a modern Police Interceptor drivetrain in it and have it true to its namesake. Is there any other option? I think this Jeep Cherokee Chief is something that you just don't see anymore: a good looking, full-size two-door SUV. While the car has been sitting for the better part of a decade, the seller has a detailed account of what was done to get it road worthy, and what needs to be done before it takes over anyone's daily driver duties. At a ~$2,000 bidding price (at the time of writing) with not a lot of time left, it's an awesome addition to anyone's quirky car collection. It'll beat the pants off any new SUV in the rugged looks department, and it was built in a time when "you think that's bad? You should've seen the other guy!" was the only outcome of a car accident with a Jeep. Let's go back to that.